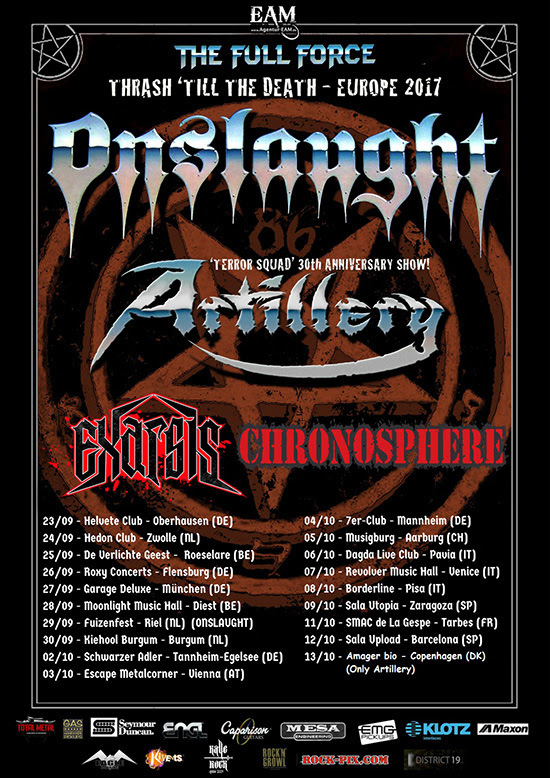 The Danish thrashers Artillery have recently announced that will be co-headlining ‘Thrash Til Death’ European tour along with Onslaught starting in Oberhausen, Germany next month. They will be joined by their Greek brethren Exarsis and Chronosphere. This year also marks the 30th anniversary of their ‘Terror Squad’ album so their fans can expect to hear some of the classics from the band’s early days along with new material from their last opus ‘Penalty By Perception’. Artillery are currently in the studio putting the finishing touches on their new album ‘The Face of Fear’ which will be out later this year. This entry was posted on 31st August 2018 at 8:21 pm and is filed under Metal, Misc., News with tags Artillery, European tour, Onslaught, Thrash metal. You can follow any responses to this entry through the RSS 2.0 feed. You can leave a response, or trackback from your own site.